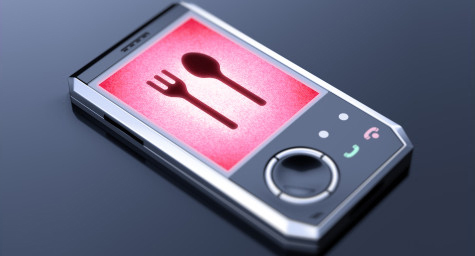 The National Restaurant Association (NRA) emphasizes the importance of using the latest mobile technology to reach the coveted younger demographics of diners. In fact, a recent NRA report revealed that a sizeable number of diners under age 50 would like to use mobile apps to make reservations at a restaurant and order their meals. Beyond their strong consumer appeal, these mobile apps also offer innovative features that can improve a restaurant’s overall efficiency and operational effectiveness while increasing regular foot traffic. To help restaurant marketing professionals find the mobile apps that best meet their unique needs, SoftwareAdvice.com compiled a list of the leading mobile apps for restaurants. 1. Check Out ChowNow – Designed for hungry yet busy professionals, this online ordering app provides access to restaurant menus directly from their websites, Facebook pages, and on the ChowNow app. After placing and customizing their orders online, the order is sent to a tablet at the restaurant for completion and pick-up. It’s proving to be extremely successful for restaurant proprietors trying to reach diners on the go. 2. Discover Diner Connection – To help restaurants and diners better manage wait times, this text-based mobile app allows customers to place themselves on wait lists upon arrival and receive a text when their table is ready. This app makes it much easier on hostesses, who often spend too much time trying to handle these complex lists and track down wandering customers. 3. Try Tabbedout – Restaurants wanting to improve the payment process will love this mobile payment app, which lets diners pay their tabs via smartphone. Customers simply enter their credit card details and personal passphrases to view their tab, and then choose their method of payment, tip amount, and whether to split the bill. Restaurant owners praise how the app ensures proper payment while allowing servers to spend more time with customers. 4. Bring in Belly – Perfect for encouraging repeat customers, this digital rewards system for restaurants lets users earn reward points for every visit by simply scanning their rewards cards or codes into their smartphones. The restaurant determines the range of rewards to meet their particular needs and clientele. 5. Uncover Uncorkd – Ideal for upscale restaurants and bars with extensive wine lists, this iPad app offers diners detailed information about available wines, such as its age, origin, and recommended food pairings. The app also enables proprietors to instantly update their wine lists from any computer. 6. Get GoPago – Quick-service restaurants will appreciate this one-click mobile ordering app since it allows customers to practically skip the line by ordering food and paying directly on their smartphones. Restaurants using it report higher foot traffic and more return customers because it greatly lessens the wait, especially during busy times. Mobile apps for restaurants can make a major difference for proprietors by allowing them to boost their traffic, ease their operations, and develop a loyal following, all with one quick click. To discover how mobile restaurant marketing can capture your audience’s attention, contact MDG Advertising. At MDG Advertising, our 360° marketing approach uses just the right mix of traditional and online media to reach your restaurant marketing goals. While some industries may fare better in print and others online, we strive to create a balanced approach where digital and traditional marketing efforts support each other and your marketing message is tailored to the medium. To stay on top of the latest trends in restaurant marketing, contact MDG Advertising.